What happened to Madeleine McCann? : Nuno Lourenco’s Lies – Do these prove that something serious happened to Madeleine earlier in the week? Nuno Lourenco had a major impact on the first few days of the Portuguese Police investigation into the reported disappearance of Madeleine McCann. His full name is Nuno Manuel Lourenco de Jesus. His ’phone call early on Saturday 5 May to the PJ seriously diverted investigation co-ordinator Goncalo Amaral and his team into contacting the German and Polish police, and INTERPOL, detaining an aircraft and its passengers at Berlin airport, and successfully asking the Polish police to visit Wojchiech Krokowski’s apartment in Warsaw, moments after he arrived back home. Nuno Lourenco’s central claim was that a man - subsequently identified as Krokowski – had tried to abduct his three-year-old daughter outside a cake-shop/cafe in the tiny village of Sagres, at the extreme south-western tip of Europe. Only 35 have voted so far, but out of those, 28 (80%) agreed that Nuno Lourenco’s statement was a lie. (b) He had a photograph of a car which he said belonged to the man who (he says) nearly kidnapped his daughter. The police rapidly traced the car as a hired car rented by Krokowksi for the week 28 April to 5 May 2007. From information from Sagres, we learn that an individual [Lourenco] has been surprised [by a man – Krokowski] on Mareta beach taking photos of several children and in particular of a little girl aged 4, blonde with blue eyes, who looks like Madeleine. It was the little girl's father who noticed him. This 40 year-old man, wearing glasses, tells the investigators that the photographer tried to kidnap his daughter in the afternoon of April 26th in Sagres. Thanks to the father's composure, he managed to take a photograph of the vehicle. It's not very clear and does not allow us to make out the number plate, but we succeed, nonetheless, in finding the car. The car hire firm provides us with the identity of the driver. He is a forty-year-old Polish man, who is traveling with his wife. They arrived in Portugal on April 28th, from Berlin. At Faro airport, they hired a car and [stayed] in an apartment in Budens, near Praia da Luz. Unfortunately, on May 5th, at 7am, they had already left, taking with them their camera and all the photos from their holiday. We ask the German police, through Interpol, to monitor them as soon as they arrive in Berlin. All the passengers are questioned, but no one has seen a child looking like Madeleine. In Berlin, the couple take the train to return to Poland. Thus, the Polish trail comes to an end. We would like to have seen their photos...but that proved impossible. If anyone reading this article my post has not read these analyses, we would recommend that you have a careful look through them to satisfy yourself as to whether Nuno Lourenco told the truth or not. 8. 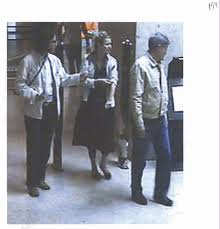 The improbability of Lourenco deciding not to report either the photographing of his children by Krokowski, or the alleged attempted abduction of his daughter to police until six days after he says these two incidents occurred (Sunday 29 April 2007). In addition to all those improbabilities, the question of the timing of his call to police on the morning of Saturday 5 May is all-important. It occurred the morning after Jane Tanner had made her statement. It was made after Krokowski’s plane took off from Faro for Berlin. And his description of Krokowski matched that of Jane Tanner in almost every detail, as Goncalo Amaral and his staff were quick to realise (see quote above). C. Not sure either way. The rest of this post is in effect only addressed to those in Group (B), i.e. those who accept that Nuno Lourenco’s statement is a fabrication and want to understand why. We proceed by noting that it is agreed all round that Nuno Lourenco was describing Wojchiech Krokowski in his statement. We believe that many, but by no means all, agree with us that Jane Tanner’s statement also describes Krokowski – and was meant to. (Even if you don’t agree with us on that point, you must at least concede that Goncalo Amaral and his team also thought that Jane Tanner and Nuno Lourenco were describing the same man). How did Lourenco prove to police that the man they wanted was Krokowski? Here we come to the crux of our article. 2: His recollection of Krokowksi’s car registration number he thought featured the letters ‘AV’ and the numbers ‘67’. Shaken by this situation, and without the least doubt that the individual’s [‘Krokowski’s] intention was to abduct his daughter, he got out his mobile and began taking various pictures of the individual [Krokowski], from the front, and in such a way that the individual would clearly see that the witness [Lourenco] was taking pictures. This did not work however, as the witness had his finger on the lens of the mobile camera. Even though the individual had left the kiosk area, he noticed that the individual had now situated himself next to the wheel of a grey-coloured, recent model Renault Clio. The witness noted the registration plate on a piece of paper which he eventually discarded, as will be explained later in this statement. This individual was accompanied by a woman, sitting in the passenger seat. The witness managed to take a picture of the vehicle which he handed over to the police, and which is now exhibited. 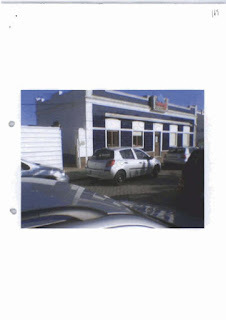 The picture is recorded as having been taken at 18H08 on 29/04/2007. After taking the picture of the vehicle, with the date/time stamp recorded by the mobile phone, a few minutes later the couple in question left in the direction of the Sagres Fortaleza. Thinking that the recorded license plate would no longer be of any use, the witness threw (the) paper in the rubbish or on the ground. In reading this statement, a great many obvious questions arise. We might note to start with that at least three different dates have been given for the date this alleged near-kidnapping took place. Goncalo Amaral in his book gives a different date. 1. How likely is it that, immediately after his daughter had nearly been snatched, he could take several pictures on his mobile ’phone in quick succession of Krokowski while he stood right in front of him, facing him? 2. How likely is it that on all of these occasions, he just happened to have his finger stuck over the lens of his mobile ’phone (indeed, is it technically possible when taking a photo on a mobile ‘phone that you cannot see if your finger is in the way or not? 3. How do we get from Lourenco taking photos straight in front of him to ‘noticing’ that he was now ‘next to’ the wheel of a grey Renault Clio? Did he chase Krokowski? Did he follow him on foot? Or did he just happen to ‘notice’ him out of the corner of his eye? Lourenco tells us nothing. 4. We are then told that he takes a photo of the car. Why does he only take one photo? 5. Lourenco says that he sees a woman next to Krokowski in the car – presumably his wife. Are we supposed to believe that all the time he was ‘nearly’ kidnapping a three-year-old, she was just meekly sitting in the car or hanging around Sagres somewhere, waiting for him to come back with a young girl? 6. If indeed Lourenco had taken a photo of Krokowski in his car, wouldn’t the most likely thing be for Krokowski to drive off in a hurry? But he doesn’t do this. Why not? 7. In fact, Lourenco says that they only drove off after ‘several minutes’. Again, are we to believe that Lourenco just stood there for several minutes, yards away from Krokowski’s car, not doing anything? Not taking more photos? Not walking up to Krokowski and confronting him? 8. Lourenco tells us that the photo was taken at 6.08pm on Sunday 29 April. It is noteworthy that he emphasises this time by repeating that there is a date and time stamp: “The picture is recorded as having been taken at 18H08 on 29/04/2007. After taking the picture of the vehicle, with the date/time stamp recorded by the mobile phone…” Now where else in this case have we come across heavy emphasis being placed on the accuracy of a date and time stamp? 9. How credible is it that he (allegedly) wrote down the registration number of the car – and then got rid of it? 10. How credible is it that he now cannot remember if he threw it in a rubbish bin or on the ground? 11. And finally, one of the most pertinent questions of them all. This man - Krokowski - had (allegedly) been photographing four children on the beach earlier in the afternoon. Then, later Lourenco (allegedly) nearly had his three-year-old daughter snatched from his side. He admits that he has a mobile ’phone with him. Where is the ’phone call to the police? The day after that (4 May)? – No. He waits until Jane Tanner has given her statement. He waits until Wojchiech Krokowski’s plane has left the tarmac at Faro Airport for Berlin. And only then does he pick up the ’phone, pretending that he is doing so because he thinks what happened to him may just be relevant to the reported disappearance of Madeleine McCann. So here’s what may have happened. 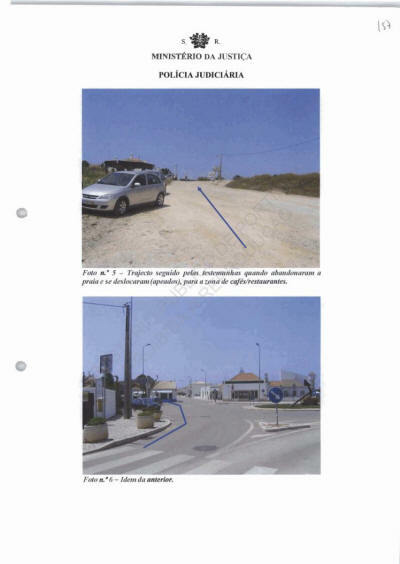 10 For Krokowski’s car to have been photographed just outside Sagres, before Lourenco gave it to the police, suggests that Krokowski may have co-operated with this elaborate hoax. We now look at how the Portuguese Police managed to deduce that the man who allegedly nearly kidnapped Lourenco’s daughter was Wojcheich Krokowski. It pleases me to inform you V.Exa, that on the present date, Inspector Rui Goncalves went to Sagres - the location where he was to make inquiries relating to a grey-coloured vehicle. It is noted that the vehicle in the picture corresponds to a Renault Clio with vehicle registration 15-AV-67. At the headquarters of the self-drive vehicle rental company, "Luzcar rent-a-car," [in Lagos] we asked them to provide us with all the information concerning the vehicle bearing the registration number...AV - 67 for the period from 28/04/07 to the time of the present investigation. It was possible to determine that the vehicle was rented on April 28th at Faro airport by a Polish citizen, named W.K., staying at Solimar in Burgau. It is clear, quite simply, that, armed with two pieces of information from Lourenco: (a) a photo of Krokowski’s hire car and (b) his memory of AV-67 as part of the car’s registration number, the Portuguese Police were rapidly able to trace who the car belonged to (the car rental agency), visit them, and establish that Krokowski hired that vehicle from 28 April to 5 May. They then rapidly discovered that he had been staying at the Sol e Mar apartment, and thereafter found out further information about what he had been doing that week. In order to determine the comings and goings of the couple of Polish nationality, who spent their holiday in Burgau, we approached several business establishments and on the basis of the description which we have of the couple, the owner of the "Beach Bar" advised us that it could be two of his clients. He seemed to recall that the couple had lunch and dinner two or three times, without remembering the exact days, but it would have been at the beginning of the week. He knows that they are Polish because they spoke about football on the day of the Liverpool/Chelsea match, saying that Liverpool's goalkeeper was Polish. The match in question took place on May 1st 2007. They also discussed Portuguese and Brazilian classical music. The couple know several performers from those countries. They asked the owner of the bar where they could buy music of this genre. The owner directed them to the FNAC shop at the Algarve shopping centre or to the Chiado commercial centre. They said they would probably go to Lisbon the same day. The investigation determines that the couple effectively went to FNAC at the Chiado centre on May 2nd 2007 where they bought two comedy musical CDs, paid for with credit card no. ... ... ... ..., the same one used to pay the Luzcar rent-a-car company for the hire of the vehicle, registration...AV-67. We seized the surveillance video and we attach photos from the FNAC surveillance system in which we can see the Polish couple in question. So – information provided by the owner/manager of the Burgau beach bar, whose name has never been disclosed so far as we are aware – led the Portuguese Police to a CCTV image of Krokowski and his wife at the Chiado Commercial Centre in Lisbon. The information, then, didn’t come from Lourenco, but from ‘the owner of the Burgau beach bar, where Krokowski had spent a significant part of week. We are not told how the Portuguese Police came to meet this individual. They say that they “approached several business establishments”. Did someone maybe ‘guide’ the police to the Burgau beach owner/manager? However it happened, the police managed to find someone who enabled them to obtain this CCTV image. 5. The beach bar owner/manager told Krokowski of two places where he might be able to get them, QUOTE: “The FNAC shop at the Algarve shopping centre, or the Chiado commercial centre [in Lisbon]”. Officer who performed the work: Renato C. e Rui G., both Inspector of the P.J. ------- When the images were shown the interviewee stated immediately, with a high degree of certainty, that the individual situated on the extreme left (from the viewers perspective) of the picture was the suspicious individual he had described in his previous statement. We have carried out investigations to find out where W.K. was staying. He was staying in apartment no.... Solimar building, Ficticia in Budens. That apartment is managed by the company ATB, situated on the Main Street, Marretas building, Burgau, Vila do Bispo, whose director, the person named Nuno F., we have contacted. That apartment belongs to Peter and Margaret O., who live in Windsor Grove, Cardiff, Wales. One key question we might ask about this is why Krokowski and his wife went to Lisbon at all that week. He had taken the plane to the main Algarve airport, Faro. He was holidaying in the seaside village of Burgau. On checking on the internet, we found that Lisbon is 320km or 200 miles from Burgau, and the journey time would be three to four hours. The journey there and back would take the couple up to seven or eight hours. Of course, they may have desperately wanted to see Lisbon that week, and have been prepared to make a long journey to do so. Perhaps they were also desperate to buy a couple of CDs of Portuguese and Brazilian classical music. All the same, it seems curious that they could not buy any of this music closer to Burgau, or alternatively wait until they got back to one of Europe’s biggest cities, Warsaw, and order the music from one of the music shops there or even order what they wanted off the internet. We see in the police report that the police seized this CCTV image (there may have been others), and showed it to Lourenco. And Luorenco “stated immediately, with a high degree of certainty, that the individual…on the left… of the picture was the suspicious individual”. There is one further curious feature of Lourenco’s statement. And that is his two mentions of being at a car rentals agency. He says he was on holiday. He was visiting his mother. His holiday was from 22 April to 13 May. He says that on Sunday 29 April he ‘returned’ his rental car to Sagres. He does not actually mention hiring it, though. And it is after he had returned his car to the agency that he says he first encountered Krokowski on the beach in Sagres. You will note that Lourenco gives no explanation at all for why he is at the Sagres car rental again on Friday. And once again – lo and behold! – as soon as Lourenco goes to the Sagres car rental agency, up pops Krokowski once again. Just like on Sunday! What a coincidence! Surely the odds against that happening are pretty remote? The other thing that is curious is that once again Lourenco sees Krokowski on his own, just like on Sunday. He is on holiday with his wife. So where is his wife? Why does he keep walking round Sagres on his own? The more we delve into Lourenco’s story, the stranger it becomes. 5 If we are right, people will inevitably ask: ‘Why would he go along with such a plan?’, and why would someone like Nuno Lourenco make up his ridiculous story about his daughter being nearly kidnapped by a Polish holidaymaker in broad daylight outside a shop and café at the south-western extremity of the continent of Europe? We would suggest that the answer might well lie in both men being connected in some way with some illegal and/or immoral activity being carried out in the area. If our analysis is correct, Nuno Lourenco should be prosecuted by the Portuguese judiciary for wasting police time and, more seriously, perverting the course of justice, or whatever the equivalent Portuguese offences are. We would welcome any comments on, challenges to or criticisms of the above analysis and the two sets of hypotheses.